Like so many poets, Thomas Stearns Eliot could write a fine letter. Unlike quite so many poets, he could also illustrate those fine letters with an amusing picture or two. The T.S. 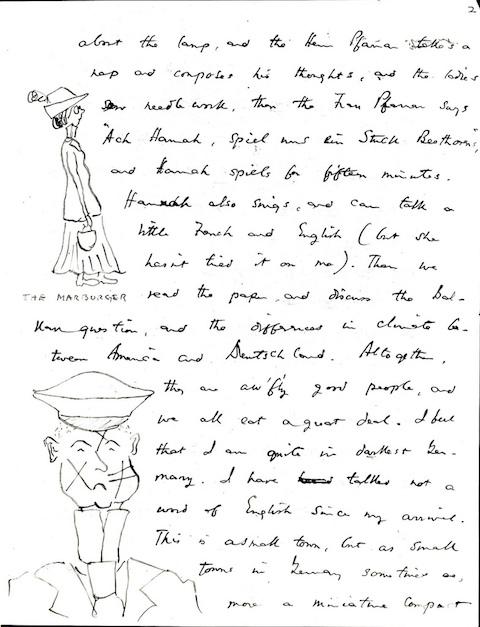 Eliot Society's web site has several examples of what the author of "The Waste Land" could do when he got thinking visually as well as textually. 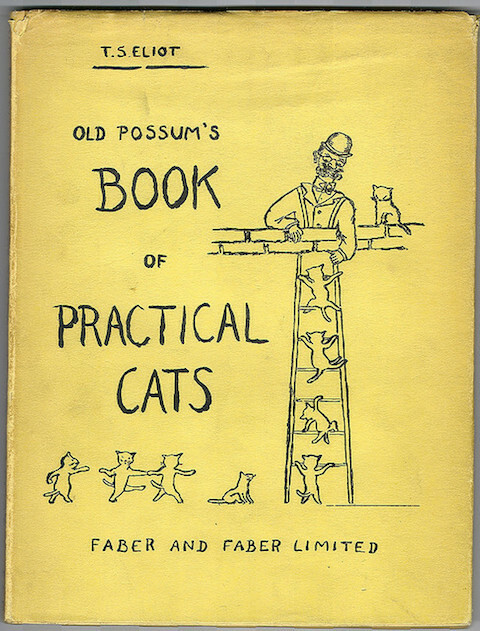 At the top of the post, we have a cover he drew for a book of his own, Old Possum's Book of Practical Cats, a well-known work of Eliot's in its own right but also indirectly known and loved by millions as the basis of Andrew Lloyd Webber's musical Cats. Well before this satirical feline material attained such grand embellishment for and far-reaching fame on the stage, it took its first, humble public form in 1939. Had you bought Old Possum's Book of Practical Cats then, you would have bought the one above, with Eliot's hand-drawn cover. (It runs $37,000 now.) The very next year, a new edition came out fully illustrated by Nicholas Bentley. The inimitable Edward Gorey took his turn with the 1982 edition, and the latest, published in 2009, features the art of German illustrator Axel Scheffler. Above and below, you can see a couple more surviving examples of what Eliot could do with pen and ink, albeit not in a context necessarily intended for publication. 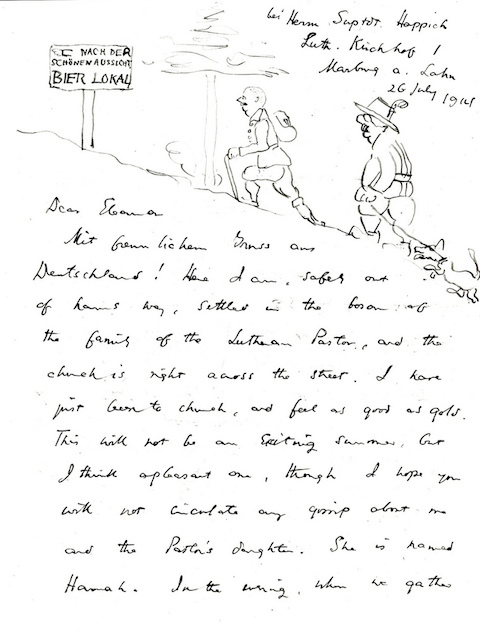 While Eliot's actual handwriting may not make for easy reading, even if you can read the German in which he sometimes wrote, his drawings vividly display his impressions of the people presumably mentioned in the text. I'd have taken such pains, too, if I had the expectation some 20th-century men of letters seemed to that their collected correspondence would eventually see print. Yet Eliot himself went back and forth about it, "torn over whether to allow public access to his private letters after his death," writes Salon's Kera Bolonik. "'I don’t like reading other people’s private correspondence in print, and I do not want other people to read mine,' he said in 1927. But six years later, he admitted he had an 'ineradicable' desire for his letters to reach a wider audience. 'We want to confess ourselves in writing to a few friends, and we do not always want to feel that no one but those friends will ever read what we have written'" — or see what we have drawn. Delighted that our site attracted your attention, and just to say that we welcome visitors from academics to general enthusiasts – and would love more to become members of the Society! I like the posts. Thanks.